Hello listeners! 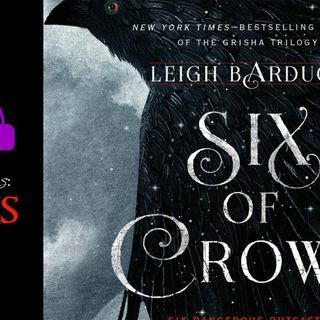 It's time for the newest episode of Six Of Crows, this episode sponsored by Jessie Pulverkuss! These chapters are really fascinating to someone like me who is into little details of created worlds. I really enjoy scenes that serve only to set the stage for the characters (as long as they're done well, chock full of information and not too drawn out) because knowing more about the world they function within can often give a lot of context to the decisions they make. ... See More Sure, a character's past can be revealing and interesting...but describing their surroundings can even lend context to flashbacks, letting us know how far they've come (or not) and whether the circumstances of their pasts are unusual or de rigeur. I'm kind of into Nina, because she's a Grisha and we haven't had a main character of that class yet, and because she's just such a good actress and liar. I'm always a fan of characters like that because they can lead to really fun hijinks, and I'm interested to see if her skills in that arena come into play at all. Also, I'm dying to know what she did to make Matthias' first act upon waking an attempt to strangle her to death. Thanks so much to Jesse for commissioning this episode, and I will see you all soon with the next one!